The entire DIO studio album collection is now complete! 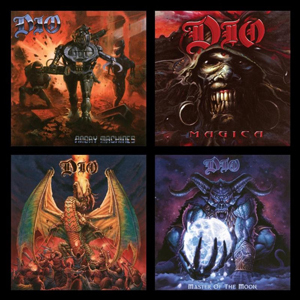 BMG and Niji Entertainment Group Inc. have partnered to reissue DIO's 1996 - 2004 studio albums. Fans will finally be able to enjoy official versions of Angry Machines (1996), Magica (2000), Killing The Dragon (2002), and Master Of The Moon (2004). These titles have sold a quarter of a million copies in the US alone and have been out of print and unavailable for nearly five years. Beginning today, September 14, 2018, all four albums will be available globally on all DSP's. The launch date lines up with Julien's Auctions tribute to one of the most influential heavy metal heroes and forefathers of headbanging music with the "Property from the Estate of Ronnie James Dio" auction, live at the Hard Rock Café in New York today, September 14 and Saturday, September 15. Features: "Don't Tell The Kids" and "Hunter Of The Heart"
Features: "Fever Dreams" and "Magica Theme"
"Otherworld" 12.Magica" (Reprise) 13.Lord Of The Last Day" (Reprise) 14.The Magica"
Features: "One More For The Road" and "The Eyes"
More info to come soon on CD and LP reissues as well as additional future plans!